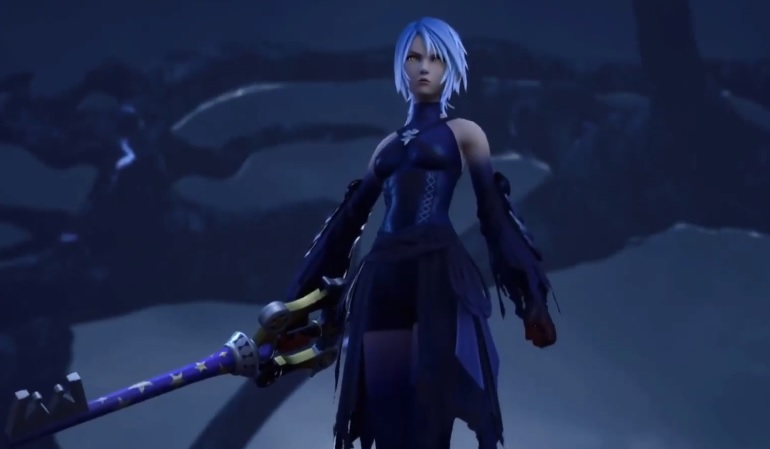 Square Enix just revealed new footage of an Aqua boss battle in Kingdom Hearts III as well as new details regarding the game during a stage event at Tokyo Game Show 2018. Check out the video above (starting at the 32-minute mark). Although Kingdom Hearts III is the end of the Xehanort Saga, it not the end of Kingdom Hearts. Director Tetsuya Nomura said he wants to continue Sora’s story. Kingdom Hearts III‘s Gummi Ship was created by a dedicated team of 20 to 30 people. There are two modes: Exploration Mode and Cardboard Mode. Exploration Mode lets you freely explore an open-world-style, extremely spacious cosmos. In Cardboard Mode, cardboard, gems, sweets, and more appear as materials for Gummi Ship customization. There are more than 20 mini-games. There will be a secret movie. However, they are looking at different means of implementing it in order to prevent spoilers. This does not mean making the requirements to see the movie more difficult—rather, they are thinking about something like releasing it at a later date as downloadable content. Online elements will be considered after work on the main story has been completed. They are looking over proposals. There are more than 10 worlds in the game, according to co-director Tai Yasue. Kingdom Hearts III will be available for the PlayStation 4 and Xbox One on January 29, 2018. Previous articleThe coolest merch finds at Tokyo Game Show 2018!